This is the original, traditional Greek salad (a.k.a. horiatiki salata) you are going to find almost everywhere in Greece. 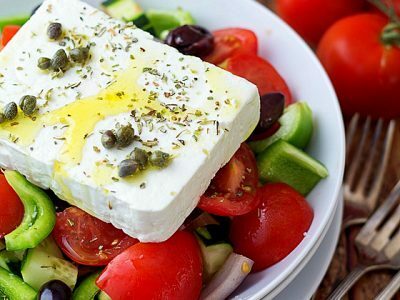 Greek salad is typically made with firm red tomatoes, crisp and aromatic cucumbers, slices of onion, creamy feta cheese and black olives, seasoned with salt and dried oregano and dressed with good quality (extra virgin) olive oil. Common additions include green bell pepper slices and/or pickled capers. Notably, the Greek salad is often seen as a farmer’s (“horiatis”) breakfast or lunch, as its ingredients resemble those that a Greek farmer might have on hand (Wikipedia). 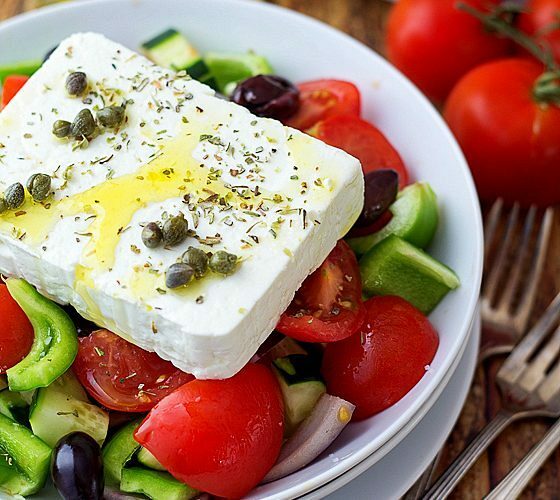 If you’ve been looking for a Greek salad recipe that actually tastes like the one served in Greece, go ahead and try this authentic Greek salad recipe. Place all ingredients in a large bowl as appeared in the ingredients’ list above. Enjoy your delicious Greek salad (“horiatiki salata”) as a side dish or as a light summer meal with lots of crusty and freshly baked bread aside. That’s all you are going to need!